This chicken dish is amazing. It’s quick, easy and re-heats BEAUTIFULLY. It’s a total crowd pleaser and can be added to/changed too! I got it from my mom, who got it from a friend, who got it from who knows where. 1. Boil the pasta until al dente (usually 8-10mins). 2. Place chicken and the Cajun seasoning in a plastic bag. Shake to coat. 4. Add peppers, onion, and mushrooms. Saute and stir for 3 mins. Reduce heat. 5. Add cream and spices. Heat through. Add linguine and heat through. 6. Sprinkle with parmesan cheese and serve! *make sure you use a pretty large pan so you can fit the pasta in there near the end. **If you want a creamier sauce, just add a bit more heavy cream. ***I sliced the chicken breasts into little strips so they would be easy to eat. And also chopped the peppers into smaller pieces too. This dish has a kick, but isn’t overly spicy at all! And it is packed with flavor. Serve with a side of garlic bread and enjoy! Looks pretty amazing!!! !… and easy, too!! Where did you get your bowl from??? I LOVE IT! I’m with you on the mushroom thing!! I bought some over the summer, and I guess they were a little old.. but figured i’d use them anyway…. and they made me SICK so now i’m grossed out by thinking about them!! @Angie: I think I may have found it at TJMaxx! It’s a Pioneer Woman recipe and is SO good! Yours looks so pretty in the serving bowl. @Julie: It’s pretty darn similar to hers! OMG! That looks SO dang good. 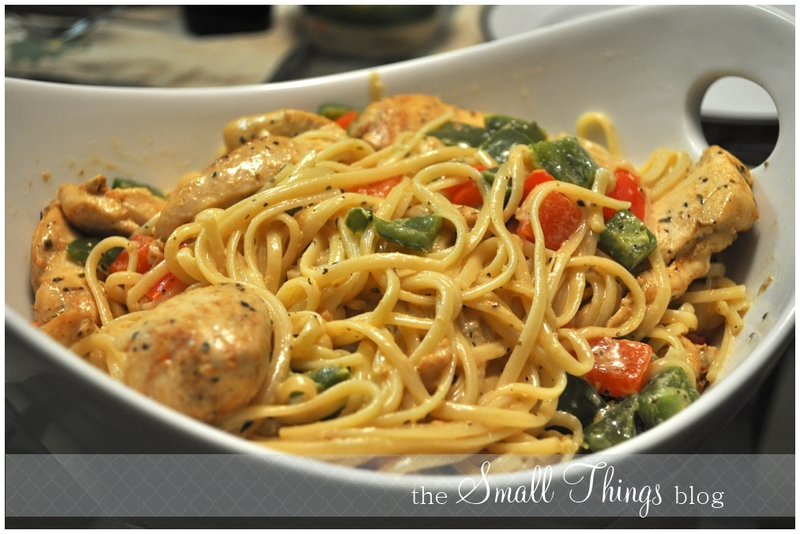 It reminds me of Red Lobsters cajun chicken pasta, which is absolutely delicious! But this looks even better. Could you substitute milk for heavy cream? I never use or buy it. That sounds and looks delicious! I’m making my meal plan for the next week and this will be on it! This looks SO good! The peppers and the butter – I can taste it now! Thanks for sharing. I’ll be making this soon! Love the recipe and that awesome dish! This looks really good!! I’m pinning it to try later! That looks so yummy and very easy to do. That looks delicious! I’m currently trying to transition to vegan, but I’m sure this can be altered to accommodate. I MUST find a way, because this looks too delicious to pass up! I just discovered your site and am IN LOVE!! So much fun stuff here! And this dish looks delish! This looks like a fantastic recipe – I love those recipes that are quick and simple to put together but are still quite pleasing to the eye. Thanks for sharing! I’ll have to try this because I have the same bowl.LOL It does look delicious and I think my husband would like it too! Pioneer woman recipe! Made it last week, soo good just add a little cream when yoh reheat! A-MAZING! Thanks for the delicious recipe!!!! I was trying to find a recipe tonight and googled chicken recipes and this recipe came up on allrecipes.com. My family absolutely loved it. I find it funny that tonight I logged on to check the blogs that I follow and see that you posted the exact recipe that I used. Ohhhh this looks so good! Ok, this is what’s for dinner tomorrow! Thanks for sharing. So my roommate and I are always looking for new recipes…pinterest has been so fun with new ideas for food! We cooked this recipe last night taken from your blog. It was AWESOME!!! Thanks for posting and I highly recommend it to any other followers!!! I made this for dinner last night! It was amazing! I did lighten it up a bit though. I used light butter instead of regular. I also used fat free evaporated milk instead of cream and I subbed whole wheat linguine for the regular. I kept the pasta a little undercooked because the sauce was a bit runny. It worked out perfect though- let the pasta sit in the sauce, it soaks it up and is wonderfully al dente by the time we ate! Thanks for sharing this and all your hair tutorials! I always had a hard time finding tutorials for shoulder length hair so I am loving yours! I made this on Saturday night with my husband and it was awesome!!! But i have a question about the a amount of dry pasta. A box of linguine is 16 oz which is 8 servings, 4 oz seemed like not enough so we used 8 oz (1/2 box) and it still wasn’t enought. Is is just lighter on the pasta and heavier on the veggies and kitchen when it’s served up? @Brandi: You can use more pasta, but be sure to double the cream and seasonings! My husband and I both thought this was delicious! The bell peppers add a wonderful crunch and brightness to the dish. Adding this one to our rotation for sure! YAY! Came here for the hairdo tutorials, left with a fab updo and a dinner recipe, too. Can’t beat that! 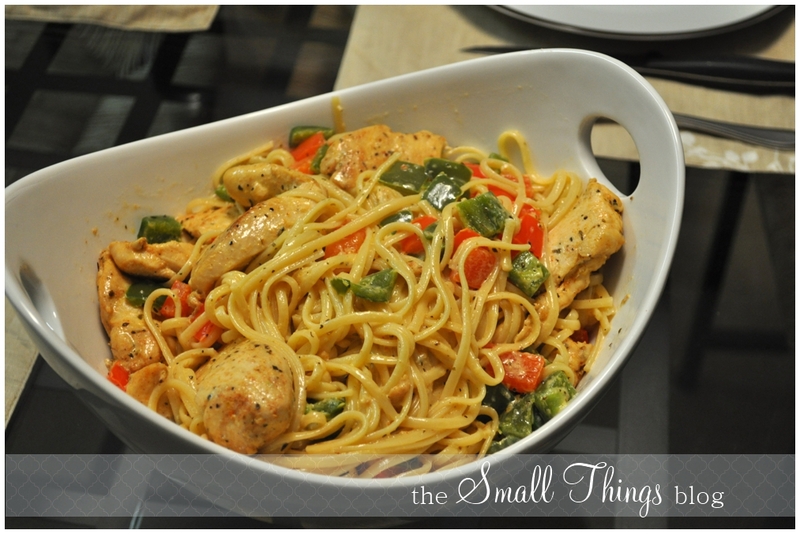 We really enjoyed this recipe and my hubby was emphatic that I make it again. I didn’t have green onions, so I used just regular onion, and instead of garlic powder added fresh garlic when I sauteed the veggies. Next time I’ll probably double the spices (except the Cajun – I use Penzey’s) and I might at the parmesan into the cream to thicken the sauce a bit. But that’s just me – it’s completely delicious the way it is. I absolutely adore this blog and I’ve recommended it to all my friends!! Thank you!! I found your blog either thru another blog I read or someone mentioning your video’s. I decided to just look over your blog even though I was not much interested in the hair tutorials but poped out this great recipe. I tried it last night and OMG it was delicious. I had been looking for different recipes to try, and made this dish tonight. It was AMAZING! I will definitely be making it again! I’m almost 9 months pregnant so it gave me some heart burn but it was totally worth it! Thanks for sharing!! Thank you Kate!!!! This is my husband and my favorite dinner to make!!! We have been making it since November almost every week! Thank you Kate!!!! My daughter looked over your blog all weekend and then I made this for lunch today. It was a big hit and so easy to put together! We’re glad we found you!